Daily occurrences that make me turn my head at a 90 degree angle and say "Whaaat?" Race Versus Stereotypes, Which One Is The Real Problem? We have all read the stories. “Black man gunned down by white cop”. “Another unarmed black teen killed.” “Black cop kills unarmed white man.” “White police officer texts racist things and resigns.” “Muslims threatened because of their dress.” “People walk off plane because Middle Eastern man looks menacing.” “Jewish temple bombed.” “White supremacist affluent member of society” I could quote headlines for days and still have thousands to use. What is the meaning of all of this? I mean, why are we making race the main focus of horrible occurrences? I know headlines are meant to evoke the emotion to encourage people to read the rest of the story. I am not going to lie, my article’s headline was meant to do the same thing. But I am trying to figure out why. Why as a society do we continue to try to capture the reader’s attention by creating a bias? A bit of history. I am Caitlyn. I am considered white. Female. From the middle class. These are classifications. I am classified as such because society has an overwhelming need to place everyone in a certain box. I have always cringed when filling out personal information. You know, when you fill out a doctor’s record, or a census. “Check the box… Black, Asian, Hispanic, non-Hispanic.” What the hell is Non-Hispanic? Isn’t that Black, or Asian? What the hell is black? Isn’t that a bit ridiculous? Black… A dark color… How about White? a light color… I myself, vary in pigment from season to season. And I have never been “white” that is literally the absence of color. Albino if you will (Which should be a box option as well). Why is there no middle ground? Why are these people so interested in the color of my skin? I will tell you the box I would like to check. “The great granddaughter of Croatian and German immigrants that faced many perils coming to America and arrived in a place that didn’t speak their native language and were forced to be the strongest people I could ever know in order to make a life for themselves and their children.” (That would be a long but accurate one.) That never seems to be an option though. How about for others. Why is there no box for, “Hey, I’m an American and have been one all of my life but happen to descend from Africans brought over here without their permission and against their will to work for free .” or “I came here on my own accord to give my family a better life and respect my new environment but still want to instill in my children the customs of our ancestors.” This is the reason, my friends, we have stereotypes. Let me explain. The definition of a stereotype is: “A widely held but fixed and oversimplified image or idea of a particular type of person or thing.” Please read that again. Did you? Okay, let it sink in for a moment. 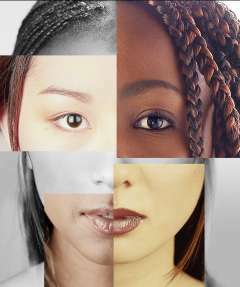 How about we look at the definition of Race: “Race is a classification system[specify] used to categorize humans into large and distinct populations or groups by anatomical, cultural, ethnic, genetic, geographical, historical, linguistic, religious, and/or social affiliation. First used to refer to speakers of a common language and then to denote national affiliations.” So clearly, one is trying to lump everyone together and the other is trying to lump everyone together, … But in separate groups. Wait, what? My reason for writing this is because I am completely and utterly SICK of people confusing race with stereotypes. We are constantly bombarded with stereotypical stories. I gave a few examples at the beginning and pointed out the difference in definitions above. Please refer back to them as needed. Stereotypes are used as an out. An excuse for individual actions and subsequent reactions. A reason to hate, or fear, or trust, or admire. Attempting to evoke emotions based on stereotypes alone is as useless as a toilet that doesn’t flush, sure it works for a little while, but then it just becomes gross. WE are people. I am a person. I want to be defined by the color of my skin as much as I want to dive head first into a 3 inch pool of water. We are better than this. I know I am lucky. Not because of who I am or what color I am or how people perceive me, but because of who I have chosen to get to know and learn from. I am lucky to have had many amazing life experiences. And because of that, I am not scared. I don’t lump people into uncomfortable exclusionary boxes. I know people from all over the world. People who are not the same religion, or age or color as me, (though as a side note, I have yet to meet a person that is the EXACT same color as me). I have learned SO much from those who are not like myself. That is TRUE learning. People say we fear what we don’t understand. Well, then, we need to start trying to understand. There have been many a humbling time in my life where my preconceived notions have proven me ignorant and wrong. I am not perfect. I am just a student of life. But I learned from those experiences and so can the rest of us! I know we are different colors. I know some of us speak in slang. I know some of us have accents. I know some of us like food that is unusual. I know some of us praise a God that has different rules. I know some of us wear clothes that are eye catching, I know some of us that have a different set of values. I know some of us that have had REALLY difficult childhoods. And I KNOW we are all here together. TOGETHER. We are in this together. This entry was posted in Uncategorized on September 7, 2014 by caitymarie03. Drivers of America… It’s time for a Refresher Course on the Rules of the Road!